Meet Leia! 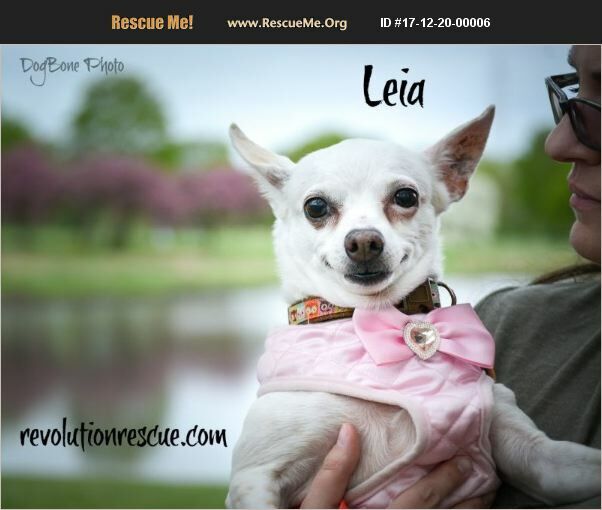 Leia is a 9 years young chihuahua who spent the first 8 years of her life in a puppy mill. She is enjoying freedom and loves to nap in dog beds and shower her foster mom with kisses. Leia is looking for a caring and compassionate home that will help build her confidence and understand she is a bit shy when meeting new people. She enjoys other low energy dogs her size and gets along well with the cats in her foster home. Leia is house-trained as long as she is taken outside regularly. She is learning to walk on a leash and requires a home with a fenced yard to allow her to continue with this training and explore her world in safety. Since she often takes the lead from other dogs' behavior, she would do best in a home with another dog. Leia does have a heart murmur which she takes an inexpensive medication for once a day. Leia is spayed, current on vaccinations, and microchipped. Suggested adoption fee for Leia is $225.00. If you are interested in meeting her complete an application from our website at www.revolutionrescue.com and we will be in touch!